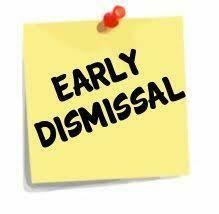 Monday (12/17/18), Tuesday (12/18/18), and Wednesday (12/19/18) will be early dismissal days for St. Landry Parish Schools. Central Middle School's final dismissal on those three days will be at 12:25 pm. Students will not report to school on Thursday or Friday of next week.